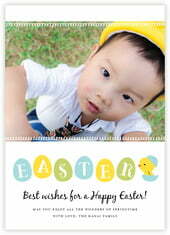 Have a happy Easter or other spring party with this adorable style. 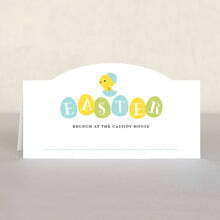 The cutest little chick in a tiny egg, and little colored eggs bouncing along telling you about Easter… Springy spiraling lines in pale colors and a happy, fun script style for the main letters, tells everyone that a happy day is ahead for all. 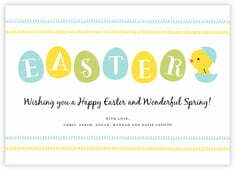 Customize your Chick cards today!